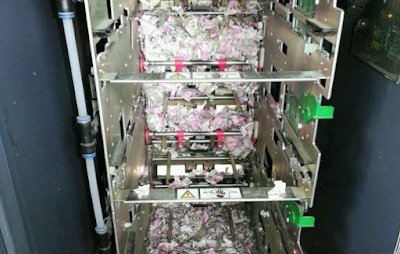 The pesky rodents reportedly tore through hundreds of bank notes - worth around 1million rupees - in an ATM in India's north eastern Tinsukia district. Officials managed to salvage a wad of cash worth around £8,000 from the wreckage - but most of the haul was left unusable. The machine had reportedly been reported faulty on May 20, with engineers not arriving to fix it until June 11. Police believe the rodents could have entered the machine through an open hole meant for wires. But bosses at Indian Bank FIS have launched a probe into the incident, however, saying they have doubts about how the damage was done. A spokesman said: “The carcass of a rat was found among the shredded notes. “However, this three week period marks an unusually long time for an ATM to be out of service.